With my first two kids, I had a second-hand baby rocker that we would use to set our child in whenever we needed free hands, or just to set the baby down for a moment. It worked alright, but by the time it came around to our second child it had seen better days. My children don’t suffer from any health conditions, but the rocker definitely isn’t designed do anything to prevent flat head syndrome or ease the feeding process. When I stumbled across Baby Beanbags, I was instantly smitten. I thought that it not only looked cool, but provided tons of benefits for baby. I had to try one. 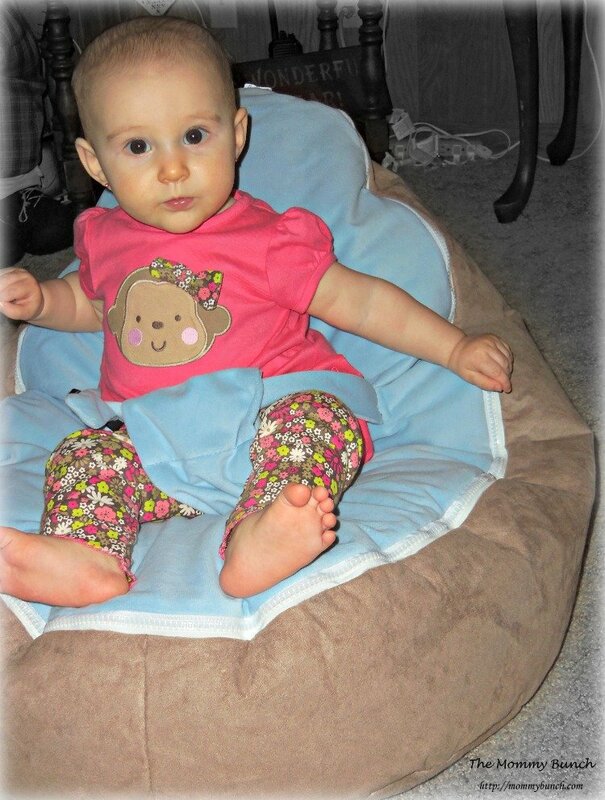 The Baby Beanbag has a strap to secure the baby, just like any normal baby seat/rocker/swing. At first, this little cutie was slightly nervous because she didn’t know exactly what she was getting herself into, but after a little bit she warmed right up and was all smiles. We haven’t had the beanbag long enough to test for any long term benefits, but so far it seems to be really comfortable, and it fits baby really well. Washing: Both covers can be washed on a cold machine wash or by hand. Washing: PVC bases can be wiped clean with a clean, damp cloth. Suede bases are water repellent and spills should be blotted off with a clean cloth. Drying: PVC bases can be dried with a clean towel and suede bases should be air dried if wet. The only thing I did notice about using these is that an older baby (such as the cutie-pie we have pictured here), might be able to lean and move around more than an infant. Little Fynlie is about ten months old, and if she tried to lean over far enough or hard enough she could probably wiggle out or flip over with enough effort. 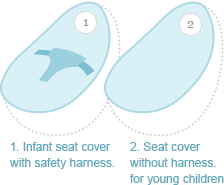 The website does have a question and answer section that covers this, and suggests that changing the newborn cover over to the regular cover should be based on your judgement as to when your child has reached a size and activity level whereby it is no longer appropriate to secure them into the Baby Beanbag. Many young babies suffer reflux. Moving the filling to the back of the beanbag you can sit your baby in an upright position during and after feeding to reduce the chance of painful reflux symptoms and avoid distress for your newborn. Some newborns suffer flattening of the head from spending so much time lying down. Baby Beanbag microbeans provide support by moulding to your baby’s head without causing the pressure of other surfaces which can contribute to Flat Head Syndrome. Baby Beanbags are great value thanks to the many years of use your child will receive. Your newborn gets the support and safety they need from the harness cover and the harness-free cover creates a beanbag for your child to use until school age. The bean filling makes Baby Beanbags extremely stable and since the double safety zipper cannot be opened without a paper clip the filling remains out of harms way safely within the bag. Read about all the additional benefits by visiting the Baby Beanbags site and watch the informational video below. Are you ready to try a Baby Beanbag?! We really enjoyed trying out the Baby Beanbag and think you would too! Baby beanbags are sold in Australia at babybeanbags.com.au, but can also be purchased in the U.S. by visiting babyhaven.com. 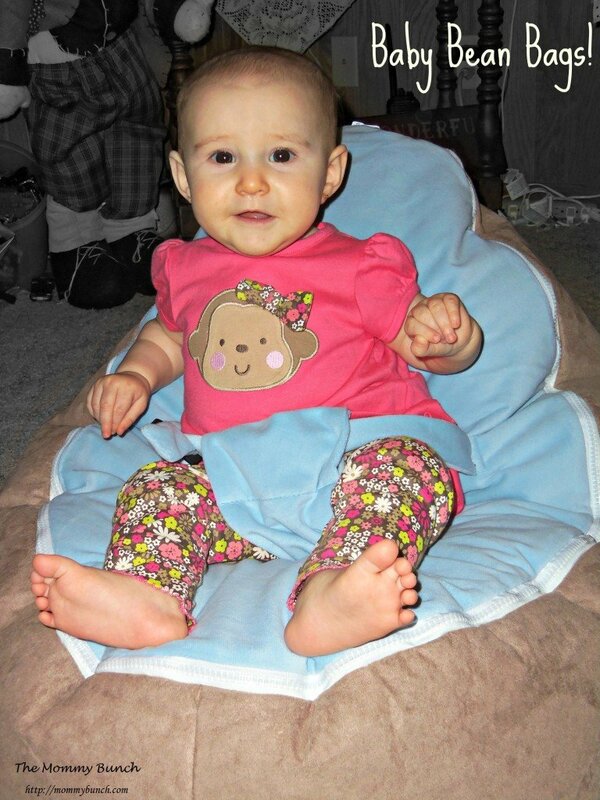 Don’t forget to check out Baby Beanbags on Facebook, Pinterest, and Twitter! My only suggestion would be to change the top cover as your very cute little girl is too big for the harness for sure. You can also remove some of the filling as the older they get the less filling they need as want to snuggle into the beanbag. 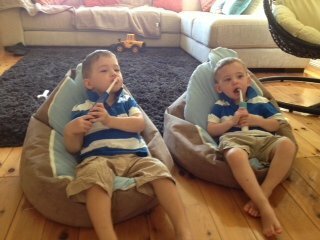 I have attached a photo of my 28 month old twins to show how they do last. The in-between age, or the time the beanbag is less used is probably 7-11 months as they can sit up but may not have the strength and co-ordination to climb off and on the beanbag. But the beanbag can still be used as a back support, to support the children’s back when teaching them how to sit up with some support (So completely remove the child from the beanbag and put the beanbag behind).